Hello Basketball World - This is your fellow basketball player Judah signing in. A lot has happened since we last spoke and it would take days to talk about it. However, I am going use this time to highlight a little of what happened this week. 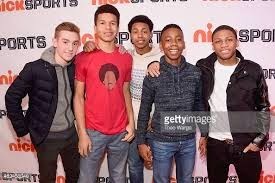 Weekend – Nickelodeon Press Release and screening of Little Ballers I was involved in the press of Little Ballers and I had several things I had to do for the event. First we got to Chelsea Piers at 1 pm and prepared for what would an incredible evening. I met the stars kid reporters of Nickelodeon, Skylar Diggins was there, Rev Al Sharpton ( A real MVP) was there. Jr. Smith, Galloway, and other stars were there to name a few. A few of our friends from Team Rio also came through to support. We had to do video taping with Byron Davis ( A NBA Legend) as well. Did I mention the food? There was food for Kids. I was very excited. The screening went well. We were able to enjoy the day with some many guests and stars that came through. Monday – School was great! I actually enjoyed school. I practiced with my Middle School team and prepared for the last 2 games of the season. When I got home, my dad and I went to the gym to work on my endurance. Jump ropes and thread mill was all I did for 2 hours. I was exhausted! Tuesday – Today was a bit more challenging in school. I was learning about rocks in science. This was not going very well. I had exams that I had to study for Wednesday and some of the things I did not know very well. So I had to use study hall time to get help from teachers who made themselves available to help. I was grateful for that. I did not workout on Tuesday, I had too much homework and studying to do. Wednesday - I was ready for tests! Well that’s I thought. The ELA and Math tests went well but the Science review on rocks was not good. I knew this was a problem. The worst part is that I have to bring the test grades home to show my parents. I had a game after school – which we won by 35 points. I actually worked out after the game because I felt that I did not get a good run in the game. Thursday and Friday – I got sick eating some bad pizza on Wednesday night. I haven’t felt this bad in years. I was throwing up and my to ask my dad for help. My mom and dad do not believe in us taking a whole bunch of medicine, only if it is necessary. So he boiled me some Chamomile tea with honey. He told me to drink lots of fluids and let the bug pass through my system. They were right! Saturday – I stayed home and relaxed. Then went to my friend, dinner birthday party at a restaurant. Of course you know I did not eat much of anything!!!! Well you know this week is the big week – ‘LITTLE BALLERS WILL PREMIER ON NICKOLODEON.